Dry shampoo part nuisance, part time saving. Tell me how many cans, bottles or sprays of dry shampoo have you bought in your lifetime and just how many would you recommend to a friend? Chances are not many brands would make the cut. For me there is two dry shampoo's I will recommend to all that will listen but when push comes to shove they aren't all that dissimilar, well unless we are talking price. Enter Dove Refresh + Care Dry Shampoo, no really Dove Dry Shampoo is the bee's knee's! It does everything that Bumble Bumble Pret-a-Powder does, minus the adding grip to the entire hair shaft but my guess is most people won't really be looking for that in a dry shampoo? Not only is it so much cheaper (£4.49) a can but in my humble opinion it smells so much better than the Bumble and Bumble version. Think of the typical Dove soap scent we all grew up on but slightly fresher. It easily removes excess oil from the roots, adds volume and doesn't leave my scalp irritated nor does it leave a white cast. I am converted and I kid you not when I say no other dry shampoo quite masks the pollutants of city living like it. You really do have to try this if you struggle with dry shampoo. You can pick it up in Boots for £4.59 a can or two for £5 - link. I have never tried dry shampoo because I wash my hair every single day. I know it is really bad but it's one habit that I cannot break. I've tried Dove normal shampoo before and really didn't like it! Maybe their dry shampoo will be better. Might have to give this a go, I've always stuck to Batiste but I think it's time for a change. You should try the KMS makeover spray, it's so light and refreshing. I've just picked up some Dove Dry Shampoo. Heard so much about it so I'm looking forward to seeing if it lives up to the hype! 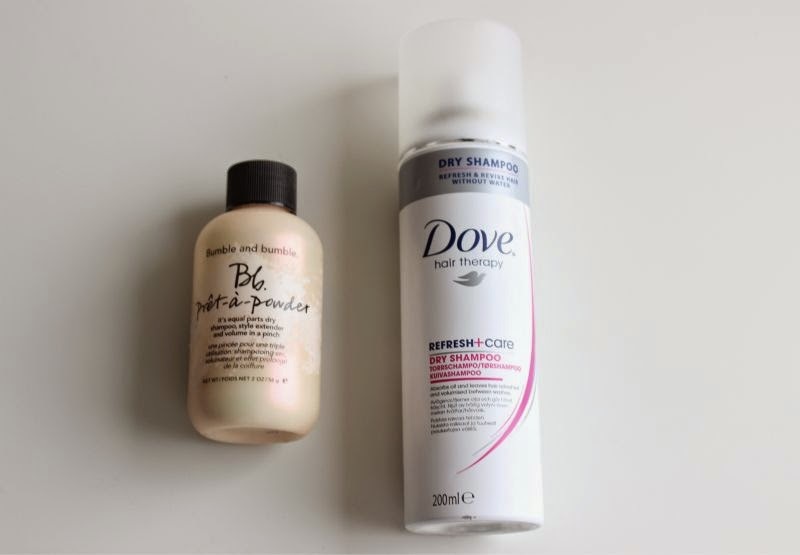 Defiantly going to give the dove dry shampoo a try! I didn't even know they did a dry shampoo. I hear so many talk about the Dove one and I have yet to try it! I need to get on it! Oh wow I'm going to check this out, i haven't seen this one by dove before. I had no idea Dove did a dry shampoo, will definitely be giving it a try! I've got such a love hate relationship with dry shampoo! I normally just go with Batiste - it's inexpensive and classic! Want to give Pret a Powder a whirl too though! I have Batiste but I don't really like it so will have to try the Dove one out! I bought this after the last time you recommended it & I'm absolutely loving it. The scent is fresh & clean, & I really like the fact that as well as soaking up excess oil it also adds volume. I have the dove one too! It works good, I just wish the scent was not so strong. The good thing about it is that the scent does eventually "tame" down a bit as the day goes on though.